Three years ago a BBC journalist called Brian Milligan drove from London to Edinburgh. Not exactly an earth shattering journey but, to be honest, he made a bit of a meal of it. He was driving an electric car, a Mini-e, an experimental test vehicle that could only take a slow charge. I'm not slagging off the Mini e, it was an amazing car to drive but it was used as a test car by BMW when they were developing the awesome BMW i3. Brian Milligan reported how hard it was to drive an electric vehicle long distances and indeed it was very hard. It was January, it was cold and he couldn’t have the heating on and it took him 4 days! There was very little charging infrastructure 3 years ago and even if there had been rapid chargers on the route they wouldn't have been any use. The Mini-e wasn’t equipped to use them. The media response at the time was huge, the usual suspects of the British press had a field day and every right wing news outlet in the USA carried the story, big time. Every sceptic, every petrol head and know-all nay-sayer had a whale of a time, they sat back and laughed at how absurd this technology was. 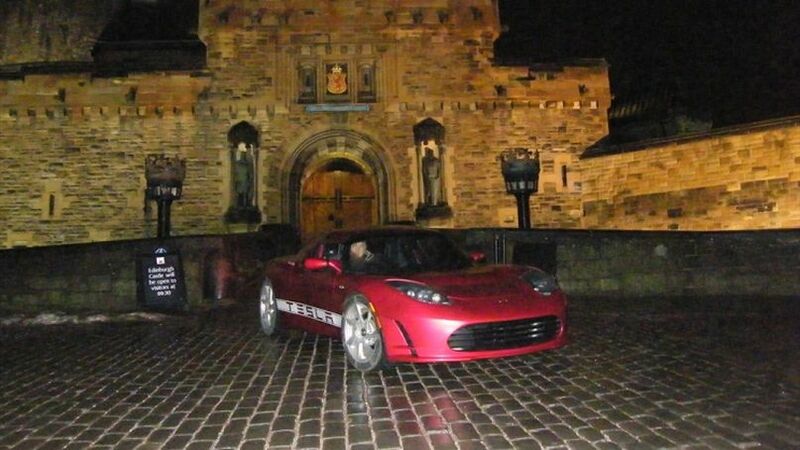 Two days after Brian Milligan left London a man called David Peilow drove from London to Edinburgh in a Tesla Roadster and actually got to Edinburgh first. Now, to be fair to Mr Milligan he said that it was ‘a golden age’ for technological development and ‘in a few years’ things would change. Well, now it’s 3 years later and as he predicted the picture is rather different. This Friday the 24th of January David Peilow and I will set out from central London in a Nissan Leaf and drive to Edinburgh. There is now a rapid charge network all the way there. The route we are taking is approximately 391 miles and David (who is good at maths) thinks we’ll do it in a leisurely 11 hours. If you drove the same journey in a modern, fuel efficient petrol car and didn’t stop once, even for a wee, you could do it in 6 or 7 hours but I would suggest your bladder would explode before you got to Newcastle. Not only that, you would spend a minimum of £70 on petrol whereas our journey will cost exactly zero. Yep, you read that right, Starbucks may get a few quid but we won't spend one penny on fuel. c) Electric cars don't actually use that much electricity. For a start, Ecotricity generates plenty of electricity from wind and the actual amount of kilowatt hours consumed by the few 1,000 electric cars on the road today is relatively small. I will be making an episode of Fully Charged about it, but we will also be tweeting and bloggering about the journey as we head north. So check the feed this Friday. Both here and on the Twitters, follow #LeafEL or #LEaf.... (i.e Leaf London to Edinburch or London-Edinbrugh af... uuuum) we can't decide which.